samsonite vanity case/hand Luggage / Hard Shelled . Condition is Used. Dispatched with Royal Mail 2nd Class. Combination code is set to 000 . In good condition . Betty Boop hard shell vanity case style bag. Betty Boop logo on front and back, silver sides and base. Base has small feet. Inner zip pocket and elasticated sections to hold toilety or make up bottles. ANTLER Case. Pink, travel, vanity, make up. ANTLER Case. Pink, hard shell. Rigid carry handle. Zip around, lined with inner zipped pocketand storage. Can be opened flat. Item: This sale is for a black hard case, mostly likely a ladies vanity bag. 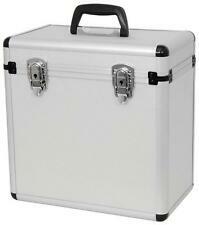 Ladies Vanity Case. Condition: It is in pre-owned but unused condition, with a few light marks which would probably wipe off and a scratch to the handle. Boros L 29cm x D 17cm x H 31cm. Samsonite L 31cm x D 21cm x H 29cm. LOUIS VUITTON. Nice vanity case in Monogram. two leather bottle holders. Vachetta leather trim a few faint marks but nothing significant. Single top carry handle. 100% authentic. this model is currently £1740 on the LV website. Turborevs Ltd was established in 2006 out of our passion for modified cars. This led us to start importing our own parts, the first ever part we imported was the lambo door kit, we managed to buy it for half the price that was available on the open market and once it was fitted on our Mitsubishi Evo well let's just stay we have never looked back. This pretty patterned Overnight Trio 6 Piece Bag Set is a must have carry case for busy girls. The colourful bag has one outside pocket and several inside pockets for storing your diary, purse, phone and other belongings. Large Vanity - Iles Marquises. A gorgeous chic storage vanity. Zip close with gem pendants. Out account details are as follows: Sort Code 12-24-82 Account Number 02269299. Our IBAN and BIC numbers are as follows IBAN is GB46BOFS12248202269299 and BIC is BOFSGBS1BBB. Revelation Make. No key but the silver coloured fastener is in good working order. Golden Tan Train Case (Vanity Case). "A MUST HAVE RETRO ACCESSORY". Overall a nice retro case. Leatherette material in a classic rectangular shape. Useful handles. Light-weight, but still sturdy enough tosit upright or flat down. Old Hollywood style, touch of glamour. Would fit a smaller lap-top or iPad if you like to travel in style! 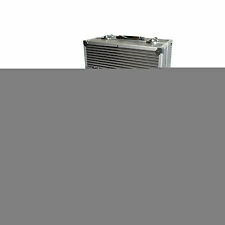 LARGER SIZE: H 14CM X L 23CM X D 18CM, GRAB A BARGAIN ! Vanity Case. Matching brown leather covered handle securely attached -. Golden Tan Brown. Overall a nice retro case - would benefit from a clean up. "A MUST HAVE RETRO ACCESSORY". Mathilde M - Douce Arabesque Large Vanity Bag. Vanity Bag - Douche Arabesque. Secure and spacious vanity bag with two small diamante charms. Out account details are as follows: Sort Code 12-24-82 Account Number 02269299. This is a used vanity case. Sorry I no longer have the keys or know the combination. LULU GUINNESS Lips Hard Sided Travel Vanity Case, Plum. Condition is Used.this has been used on one occasion so good used condition a few faint scratches nothing major and the zip pully on one of the little bags inside is missing .also there is a strap that enables you to attach it to your suit case handle needs mending if you want to use it . Dispatched with Royal Mail 2nd Class. Signed for. check out other items. Super Lightweight Soft Vanity Cosmetic Bag With 2 Compartments. Hard textured shell (sorry no keys). Size 37cm x 23cm x 24cm, good used condition, 2 keys, free pp UK. 1 inside tray to sort make up etc. BRAND NEW ORIFLAME VANITY BAG/CASE IN BLUE WITH PUNCHED OUT PATTERN WITH GOLD ZIP. MEASURING ABOUT 10x7inches. The fastener is in good used condition in working order and does shut securely with care. Blue Vanity Case. A Fab Retro. MUST HAVE" RETRO DISPLAY ACCESSORY. 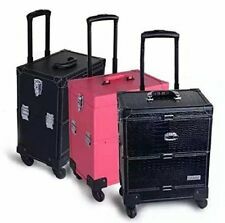 WOULD MAKE A SUPER SUITCASE FOR A "RETRO STACK". A gorgeous chic storage vanity. Out account details are as follows: Sort Code 12-24-82 Account Number 02269299. Our IBAN and BIC numbers are as follows IBAN is GB46BOFS12248202269299 and BIC is BOFSGBS1BBB. Condition is g reat Used. 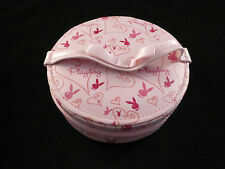 Bunny Logo Small Pink Circular Travel Vanity Case / Jewellery Box with Built-in Mirror.